There are a few things in parenting an infant that are pretty much a given. ‘Baby will be sure to need a nappy during nappy off time’ (you know what I’m saying here) is one of those givens. Here is a product that is a stylish and far more convenient solution than placing bub on a towel for their pants-free kick around. Enter the Play Space mat by Bella Buttercup. A 110cm round, padded mat in the softest cotton jersey, the Play Space is the ideal size for little babies through to toddlers who need a soft and comfortable place to play, whether at home or out and about. 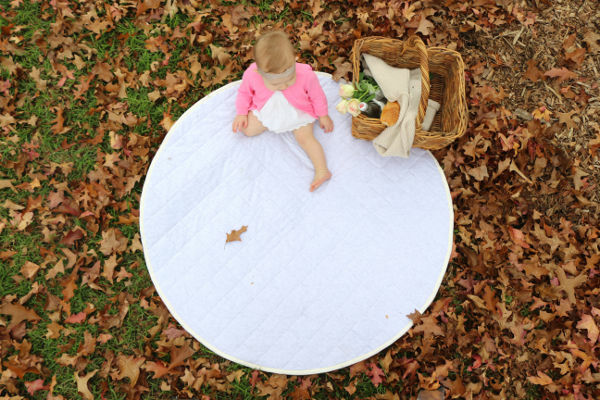 The Play Space mat is not only made from cotton jersey to be soft on your baby’s skin, it has a waterproof lining, making it perfect for nappy off time as well as providing a dry place to lie on damp grass at the park or in the yard. Of course, it is also machine washable for easy cleaning. Following the ‘baby who lies contentedly’ stage comes the ‘baby learning to roll’ then the ‘baby learning to sit’ stage. Those of us who have been there know all too well the horrible thud of a small head on an unpadded surface. 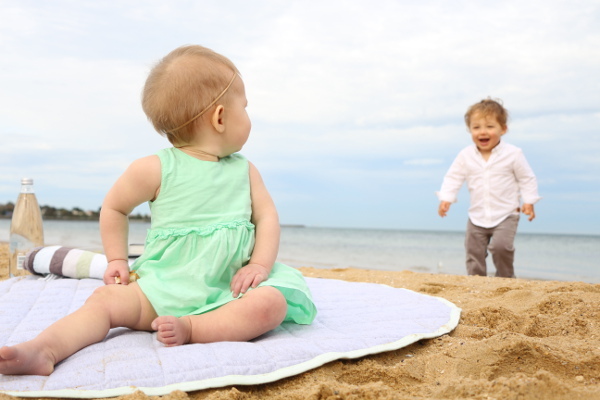 While it is not practical to wrap our babies in cotton wool, as much as we may want too, the Play Space mat is padded and quilted to allow a soft space for babies determined to fling themselves about as they move from one developmental milestone to the next. These clever play mats are available in two double sided colours: grey and powder blue or soft peach and grey. Both options are subtle and designed to fit in with your decor. The Play Space mats are $79 and available directly from Bella Buttercup. Check out our post on Bella Buttercup’s Baby Bundle for more multitasking baby goods.